First, above all else, I consider myself a student of literature. Perhaps I’ve chosen this phrase to generalize my pursuits, or maybe to conceal the small place in the world of literature to which I belong. I am a writer, albeit fairly new to the Creative Writing side of things. My first encounter with serious creative writing was in the Fall of 2013, during a course for the subject. While this is not my focus today, it is important that you understand where my time as a writer began. In the Fall of 2017, after having worked on the same manuscript for the last four years, I lost the will to keep writing every day. That soon snowballed into every two weeks, and soon every six months. Then, something happened to further my pursuit of writing. October of 2016, I was visiting my cousin’s house and heard some kind of music coming from her bedroom. The song was about a woman making a toast to her sister, who was being married to the man that her sister secretly loved, as she soon after explained to me. It was a track called “Satisfied” from Hamilton: An American Musical. I found the idea of the musical odd, but listened to the song anyway. Later that weekend, I took it upon myself to listen to the whole musical. It tells the story of founding father Alexander Hamilton from childhood, to Treasurer and Secretary of the United States. Written by Lin-Manuel Miranda, the son of Puerto Rican immigrant parents, and a former English Teacher turned musical genius. A main theme of Hamilton, is all of the writing that Alexander Hamilton worked to complete, often writing several pieces of work in little time. He kept with it, and wound up as one of the greatest founding members of our country. But why does a musical about Alexander Hamilton and his work matter to me? Because Hamilton was the answer to my silent prayers for something to keep me writing. Fast forward to May of 2018, I still hadn’t written anything new since Fall of last year and was beginning to worry that my plans for the future weren’t as secure as I’d thought them to be. Then, they announced that tickets for Hamilton: An American Musical had gone on sale for the Utah tour date. My mother decided that we’d try to get some, and hours later on the day of the sale, we wound up with four tickets. The show was absolutely amazing. The music and sound all combined perfectly to create a beautiful performance. 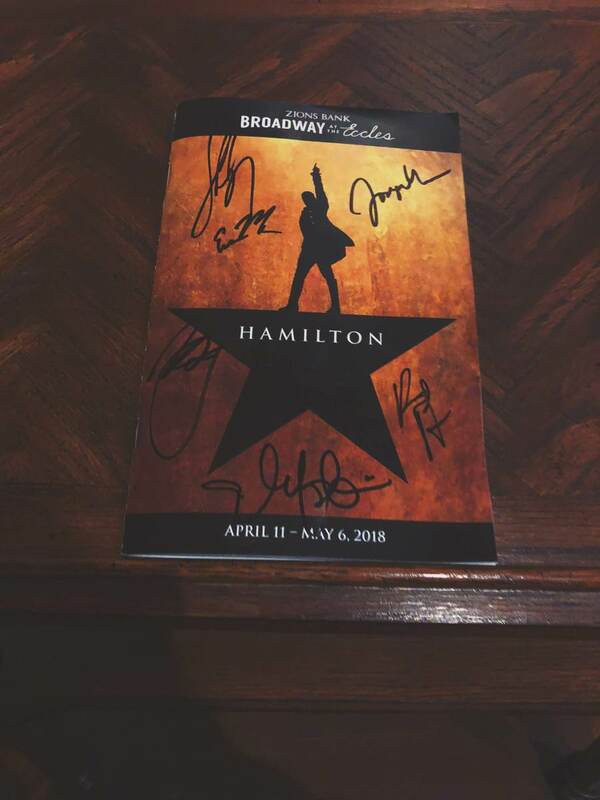 At the end of the show, we went to stage door and got our playbills signed by a few members of the cast. Later that night, as I stared at the signed bill, I understood something. Writing wasn’t about not having the time or being too busy, it was about filling the empty space between all of those moments with frenzied and unfiltered words. Writing was fluid, filling in the empty spaces between school and work. That Playbill now sits on my bookshelf, among stacks of hardcovers and paperbacks. The signatures are visible from the top shelf, and when I wake up in the morning, I see them. Those little glossy pages bound together and signed with someone else’s name remind me of a pivotal moment in my life. At that moment, I made the realization that I had been wrong about writing being something that you did sparingly, when you found the time for it or wanted the will to put pen to paper, or quill to parchment. It was, and had always been, about writing like you’re running out of time.